You need to accommodate the views of the captain of the ship you are travelling on, says President Abdulla Yameen Abdul Gayoom. Speaking at ruling Progressive Party of Maldives (PPM) rally “The People Stand with the Security Forces” at West Park last Tuesday night, President Yameen referred to himself and said a captain would never wish ill for his ship. “You should always accommodate the views of the captain when you travel on a new ship. The captain would never wish ill for his ship. The captain would never wish ill for the State,” said President Yameen. He said a ship embarked on a trip with its captain and crew either in search of blessings or safety and security. “The ship may today change into a navy ship or a ship which carries war weaponry. The ship is everything. Our trip, our destination… it all depends on the ship. We all need to question today who has to shoulder the responsibility if the ship is headed towards a reef, or meets a storm. The responsibility falls on the captain,” said President Yameen. He said there was no time for democratic vote-taking in such a situation, and that the captain has to make quick decisions to save the ship. He said the failure of the captain would result not just in the destruction of the ship, but the destruction of all onboard. “The captain wouldn’t think to let the ship get destroyed when the storm hits. But there may be some among the crew who went on the trip with a dish from some house, who gets better dishes from the same house yet. At such a situation, this person will think only of the person who gives him money. So such a person may speak against the captain,” said President Yameen. He said the captain is charged with a great responsibility, and that the captain should not be bothered at critical situations. He said that no one else can challenge or enjoy some of the powers bestowed upon the captain by law. “The captain, too, must be questioned if he has gone mad. But the captain should not be questioned for building a 25-story hospital. So all crew members need to respect and be loyal to the captain. When travelling in a storm, the crew will not question what the law says. 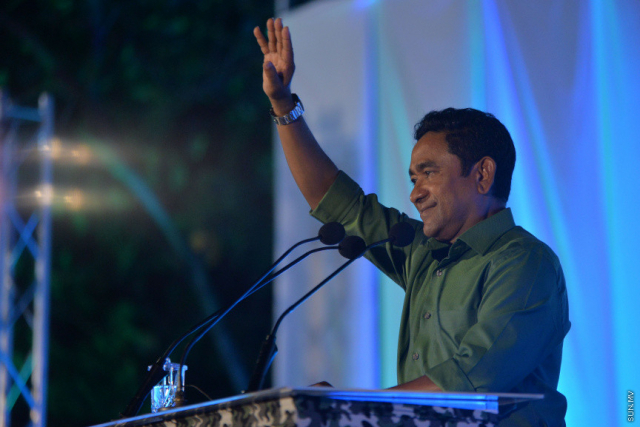 It doesn’t involve democracy,” said President Yameen.